BERLIN (Reuters) - The wave of refugees that entered Germany in 2015-2016 has slowed its integration efforts, according to a study that also showed little progress since 2005 in leveling the playing field for immigrants on education, employment and incomes. At the height of Europe's migration crisis, Chancellor Angela Merkel adopted an open-borders policy that drew more than one million refugees into Germany in two years. In the prior decade, education opportunities picked up for newly arrived immigrants and people born in Germany with at least one foreign parent. But the Federal Statistics Office study released on Thursday found the education gap between those categories of migrants and native Germans had since widened again, with the proportion of the former lacking a high school certificate growing between 2014 and 2016. 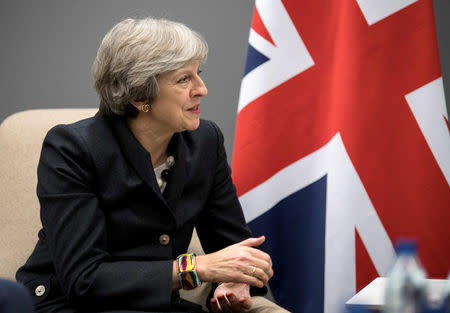 The scale of future immigration has become a major sticking point in three-party talks that Merkel is leading on the formation of a new coalition government, for which she has set an initial deadline of Thursday night. While Germany's unemployment rate has fallen to its lowest since the country's reunification in 1990, more immigrants were unemployed in 2016 than native Germans, the study said. In that year, 13.6 percent of immigrants and 6.2 percent of native Germans had low-paying jobs. Merkel's conservatives have proposed to the coalition talks that a suspension of reunifications between migrants and their family members outside Germany should be extended beyond a March 2018 deadline. Immigration expert Herbert Bruecker, a professor at the Berlin Integration and Migration Institute, said that would worsen the divide. "Our surveys show that people, who are living separated from their families, have a lower life satisfaction and also suffer more often from depression or bitterness," he said. New Delhi must find strategic partners to prepare for tomorrow. One man, Jean Monnet, has been central to the creation of the European Union. He had the vision to propose certain basic principles which became the bedrock of the multi-national institution. At the end of World War II, as Europe was going through one of the most traumatic periods, he created the "circumstances" under which a successful partnership could take shape. The first principle on which Monnet worked was: Any association, partnership or union should be built among equals. Though at the end of World War II, Germany was the loser, from the first days of the European Coal and Steel Community (ECSC), France and its neighbour acted as equals. This principle remained to date. Another principle set by Monnet and his colleagues is that the association should be voluntary. In the summer of 1950, Monnet thought of an organised European defence on a supranational basis; he presented his proposal to René Pleven, the French Prime Minister. Pleven proposed to his European partners the plan to constitute a European army of 100,000 men (including German soldiers) which would operate under a European minister for defence, endowed with a common budget and placed under the supreme command of the North Atlantic Treaty Organisation (NATO). In 1954, the European partners failed to agree to the European Defence Community (EDC); the loss of the national "independence" was probably a step too far, too early. It would have been a first if independent states had agreed to create a supranational authority to which part of their national sovereignty was delegated. It had worked for the ECSC in 1951; and with the Treaty of Rome in 1957, it had gone a step further with the creation of supranational European institutions like the European Economic Community and the European Community for Atomic Energy; however, Europeans nations were not yet ready to trust their partners for their own defence. Sixty-three years later, most of the EU states have agreed to create "the nucleus of a joint army". On November 13, 23 out of 28 EU member states signed a declaration in Brussels, which will become legally binding at an EU summit next month. Britain (which has historically opposed the EDC), Denmark, Ireland, Malta, and Portugal did not sign. For those who have followed the European integration with its ups and downs, it is an elating moment, though it did not make the first pages of the world media. It is indeed revolutionary. According to the new agreement, the European nations will jointly manage a rapid reaction force and jointly develop new equipment. A single European logistics and medical support hub will be created. The participants will be bound to increase defence funds for R&D. A single hub for overseas military training missions will also be set up. Some see this development as a reaction to an inward turn of the United States under President Donald Trump, but also the instability at Europe’s gates as well as the increasing number of Islamist terrorist attacks. The final project is less ambitious than some EU states, such as France and Italy, had wanted; but it is a promising beginning. Mogherini explained the rationale behind the move in simple words: “The world is changing.” Jens Stoltenberg, the NATO boss, meanwhile, considered the project "good for Europe and good for NATO". French President Emmanuel Macron, whose visit to India has been postponed for a couple of months, in September, called for a "profound transformation" of the EU, requiring “deeper political integration to win back the support of disgruntled citizens.” He even suggested blocs moving forward at differing speeds which may help the UK to “one day find its place again”. Macron pleaded for the EU to return to its founders’ "visionary" ideas, “born out of the disaster of two World Wars”. In other words, joint operations. A less ambitious German project ultimately prevailed. “Structured and permanent cooperation, as inclusive as possible”, it will have more chance to succeed. 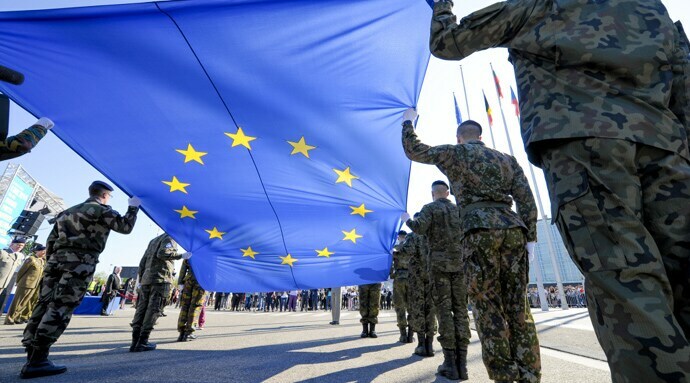 The creation of the new European defence structure is a ground-breaking move, not only in terms of European defence, but also in the field of research and development. We could tomorrow see a new European aircraft carrier, new European drones or a breakthrough in quantum communication. The French say, "l’Union fait la force" (union makes you strong). India should watch the happenings in Europe and definitively learn from it in terms of collaboration. The time has come for Delhi to find reliable strategic partners to prepare for tomorrow. I'm sure you'll achieve a lot with a combined total of £10bn. This is a first step: if the available budget was more important, it could not be spent in a useful and optimized way at first. When the proper structures will be in place we will be able to increase the budget. So at the end you will leave without an agreement. Yes and there'll be huge tariffs on all Renaults, Citroens and Peugeots and you will have to make up the UK's share of the EU bill. My thoughts exactly. Smell you later masterbater. Sancho and BMD like this. May is hilarious. She's acting as if she and her country had the upper hand. Only delusional brexiters can swallow this. We do, the majority of trade comes to us not from us. And when this trade is priced out due to WTO tariffs, the domestic market will fill the gap. Therefore we stand to gain more than we will lose, since the gap being filled is larger than any trade lost. It is French, German and Italian automakers that will be hardest hit. Equally, money comes from us not to us from the EU. So, we do have have the upper hand in every measurable way. If we didn't the EU wouldn't even be talking to us. They'd love to hurt us as much as possible and if it was a simple as saying 'no deal', they wouldn't be talking. Please stop trying to open their eyes; we don't want them to chicken out and remain at the last minute.